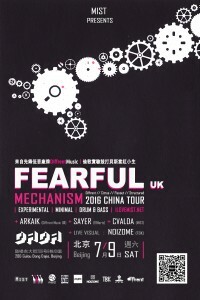 After bringing Arkaik (Diffrent Music UK) and Homemade Weapons (Samurai Music US) to drum & bass heads over China the past year, MIST will be back this summer to present you with another fresh and special sound from the DnB world. From English pioneer DnB label Diffrent Music, London based young intelligent experimental DnB producer Fearful will come to China this July for a remarkable 5 city tour with MIST and friends. As a tradition, in each city we'll have a mad lineup for you. Tea girl Cvalda will meet you in all 5 cities. In Shanghai and Beijing we'll have special guest DnB producer Arkaik (also from Diffrent Music) and my favorite Chinese bass girl DJ Sayer. Chengdu based English bass music producer Harikiri will support the other 3 cities. We'll also bring you special visuals like the giraffes from Arkaik’s last tour. Fearful AKA Chris Murray started producing at the age of 17. After years of playing bass and keys in several bands it was time to take control of the writing process without compromise. Finding inspiration from metal, hip hop and electronica he began to explore electronic genres and learned to craft his own distinctive sound. In 2012 he released debut track ‘Santura’ which featured as the title music to acclaimed web documentary ‘The DnB Diaries’. A string of releases on a variety of labels (Citrus, Flexout, Structured, Automate) followed, each one testing different avenues within the genre until catching the ear of Diffrent Music boss Dexta, with the experimental stepping rhythms of ‘Tongues’. An experienced DJ he studied his craft exclusively spinning vinyl at Brighton’s famous Volks club later being booked around the UK and rest of Europe. Fearful’s sets often twist and turn through different genres & tempos, showcasing the crossover between them that many seem initially unaware of such as 2015s ‘The Lurker’ which effortlessly switches from 170 - 130bpm without giving anything away. This is an artist not afraid to try new things with his productions, showcased excellently with last year’s ‘Mechanism EP’ which received support from some of the biggest names in the industry such as Misanthrop, Fre4knc, Amoss, Noisia, etc. Self-released track ‘Premonition’ exposes this hunger for continuous progress, breaking free from his Drum & Bass roots to explore different tempos & genres while retaining that unmistakable dark experimental sound. The title hints that there is more of this material waiting to be heard and having been very quiet on the release front since, its safe to assume a new batch of eagerly awaited tunes will drop anytime now. It all began over a decade ago, somewhere deep in the Surrey hills, that Peter Goebel AKA Arkaik discovered the all consuming musical drug that was drum and bass. After being sucked in by producers such as Bad Company, Dillinja and Roni Size it wasn't long before he was playing in clubs in and around the UK and dabbling in production shortly after. In 2008 Arkaik became a resident for Bassment in Reading, playing before artists such as Noisia, Break, Calibre and Icicle to name but a few. 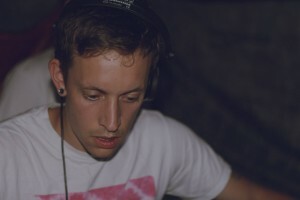 The rolling drums and thick sub basslines were a huge inspiration and are still apparent within his production and mixing style today, however it was the emergence of the more minimal sound championed by artists such as Data, Spectrasoul and Instra:mental that really inspired Arkaik's current clean and stripped back sound. 2010 saw Arkaik's first release Stress Relief/Second Bass (DIFF004) on the infamous label Diffrent Music, this would prove to be a landmark moment and the first of many releases on Diffrent. After forming a tight bond the Diffrent Music Crew went on to host many nights at Cafe 10001, Brick Lane and alongside the Genesis crew at various clubs around London. 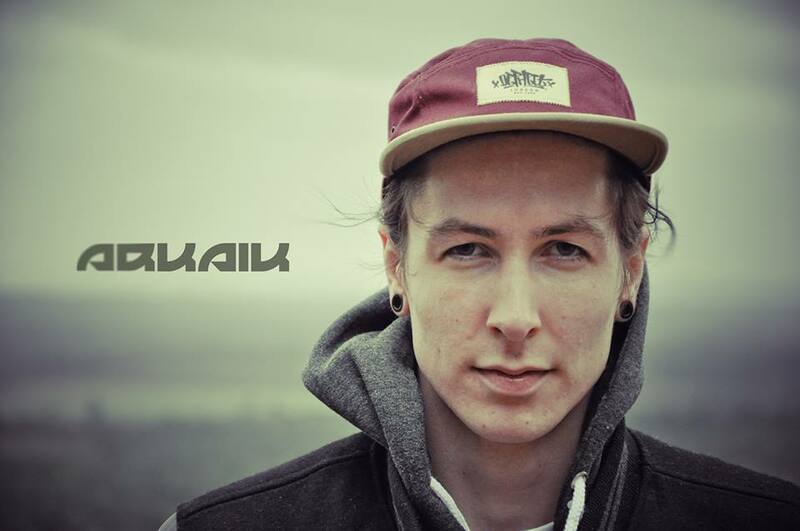 Since his first release Arkaik went on to win the Octane & DLR remix competition hosted by the mighty Dispatch Recordings in early 2012. With support from the likes of Doc Scott, Ant TC1, Chris SU, Mindscape, Ulterior Motive and Need For Mirrors this gave Arkaik a platform to release his first EP on Diffrent Music titled Trauma EP (DIFF011D) shortly after. Arkaik's second & Third EP gained musical accolade from artists such as Tony Coleman, Amoss, BTK, DBRUK, Gremlinz and Fathom Audio. Not to mention his release on Proximity records with Axon. Watch out for many more exciting collaborations in the pipeline with the likes of Amoss, Coma, Fearful, Taelimb & Transparent. Haerbin D&B lady Saye has been running repping the sounds in the north of China. Based in the icey city Harbin, she was one of the founder of Harbin's SonarMusic crew, as well as the producer of RankingBeats.Growing up listening to disco and funk, her love for drum'n'bass came when she'd discovered breakbeat and trip-hop music and led her to DJ'ing in 2012. When most people stumble upon the word "Harakiri - 腹切り" they immediately conjure up the vivid images depicted in Japanese films of disgraced Samurais committing ritual self-disembowelment in a bid to regain their honour. People with this in mind are pretty close to the mark, that is what that word means. "HARIKIRI - 張り切り" on the other hand embodies a deeper and more colourful meaning, with a little less blood. They say that a name exerts influence on one's destiny and with a name that expresses the will to "stretch boundaries to breaking point" and "passionately strive further than any other has dared before", London-based producer/DJ HARIKIRI breaks the mould. The aural landscape surrounding him is undeniably unique, merging the obvious influence of growing up in the UK with a tightly woven Caribbean rhythmic backbone and an Asian undertone acquired from long periods living in China and Japan; all fleshed out by a technical itch gained from years engineering dark, dungeon forms of electronic music. With burgeoning support from notable media outlets like Mad Decent, Timeout, K-Mag, and with global tastemakers like Munchi, Rinse.FM's Scratcha DVA, Afrikan Boy and others as advocates, HARIKIRI is set to emerge from under-the-radar with all guns blazing. Tour dates throughout Asia and Europe have seen him share the stage with a diverse array of artists such as Fat Boy Slim, Noisia, Joker, Chase & Status, Foreign Beggars, Icicle, Instra:mental, Oxide & Neutrino, at a range of venues including London’s Fabric and even in Beijing on the Great Wall of China. 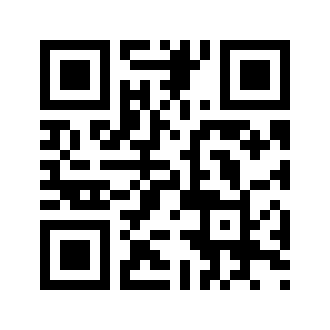 Cvalda loves electronic music and underground parties. In 2006, she founded club ‘Underground’ and music website ‘Ageofred.com’ with her best friend DJ LEE, which is the beginning of Chengdu's underground party scene. In 2009, she started to produce music and soon got a well way on it. She joined local music label Mintone Records, started publishing ambient, abstract hip-hop, or drum&bass music. She also works with artists like Miao Jing (Hibanana), documentary director Gao Wei, producing music for media art and indie movies. Late 2015, her track ‘Macao’ has been heard out of China through RinseFM by Plasticion’s ‘The Sound of China’ show. She became a bass music DJ mostly a drum&bass DJ in 2010. She played dark way jungle and drum&bass with dubstep, reggae, dub, grime, or anything she enjoyed, and her intelligence surprised the dance floor immediately. Soon, as a DJ, she has been invited by party labels/festivals like Xiong Mao, Disco Death, Chengdu Music, Dojo, Do Hits(Beijing), The Drop(Beijing), Zebra Festival, Strawberry Festival,123 festival(Shanghai), Heavy (HK), Bass Music China(HK) etc... She also shared stage with big-names like DJ Shadow, DJ Marky, Jojo Mayer, U-Brown, Nanci & Phoebe, DJ Snuff, Dub Phizix & Strategy, Jubei & SP:MC, Arkaik, Roy Green, Jubei & SP:MC, Homemade Weapons etc. By 2014,Cvalda found her new style in DJing, she called it "drug n bass". She started to do performances and studio sets called "Drug n Bass Sessions", trying to find out all the possibilities between experimental and minimal drum&bass. Recently, she started to bring more dark and minimal dubstep or ambient sets out. By late 2014,Cvalda founded underground bass music group ‘MIST’, started to promote underground bass/drum&bass music over China. Mick young, designer who live in shanghai, graphic/motion graphic designer, motion designer, UE/GUI designer, VJ. And trying to research the relationship between visual and sounds. MENG, Visual partner of HWG, a light / visual artist. With passions on using special materials to create trippy visuals. Kym To (NL), graphic designer, picked up his VJ experiences during his study of art academy in the early 2000 with VHS tapes. Medium doesn't really matter, he like to put layers together to bring you to the ultimate high!